Quahog pearls are amongst the rarest of gemstones but in fact, they are technically not pearls – they can still be very beautiful nevertheless, and they are typically stained a shade of purple, the only pearls that are so colored under natural conditions. Quahogs are pronounced “ko hog”, and are clams which many of us have enjoyed in a variety of dishes, or simply steamed at an oyster bar or restaurant. They are native to the Eastern US coast, especially around New England, and have been exported to the Pacific and European shores as they lend themselves to “aquaculture”. Indeed, in New England they form an important part of the fishing economy and are a major export from the region. It is thought that only 1 in 5,000 clams produces a pearl but, before a quahog pearl can be considered valuable, it also must possess visual appeal – many quahog pearls are misshapen, or not particularly pretty to look at, which precludes their use in jewellery. This makes those quahog pearls which are suitable for use in jewelry that much more valuable. Despite the huge commercial farming activity which processes millions of quahog clams every year, pearls are increasingly rare because of the automated nature of the process. Clams are cleaned and shucked mechanically, and this process typically destroys any pearls which may otherwise be uncovered. Oyster pearls are formed by concretions being formed around internal deformities, parasites or other foreign piece of matter such as a grain of sand. The oyster reacts to this irritant by enclosing the body with layers of hardened pearl material, known as nacre and which covers the deformity or foreign matter and it is this which grows into a pearl. Cultured pearls use the same process but the oyster is stimulated to grow the pearl by man not nature. of New England, and especially focused upon Rhode Island, are the only ones which possess the purple tint. 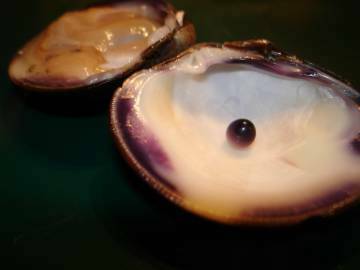 This is because the quahog clams there are the only ones which produce the purple dye, and this can cause a quahog pearl to vary from a light lilac color through to deep purple and very deep black. As these quahogs are the only bivalve which secretes the purple stain, their pearls are the only ones to possess this coloration though the degree to which an individual quahog pearl is colored will vary widely. Quahog pearls have been a sought after gemstone amongst New England jewelry makers for at least a couple of hundred years, but the quahog pearl has a much longer association with man than that. Native American Indians used the quahog pearl both for decorative purposes and as “wampum” or money. Native Americans would use the quahog pearl as a medium for exchange by carving the tabular beads and these could be used for trading. Valuation and pricing vary enormously and ultimately, the price of any item is only that which a buyer is prepared to pay. An example will illustrate the point – in 2005 a rare quahog was discovered in a yard sale and bought for a mere $14 – when it came to auction, the piece was widely valued at anything between $8,000 and $1 million! The eventual sales price is unknown as it was sold to a private bidder in a sealed auction. Surely the value really lies not in the price tag which is attached to a quahog pearl, but rather the beauty of this natural gemstone and the artisanship of the piece into which it is set. Beauty, in this instance, is clearly in the eye of the beholder. Author Resource:- Piper Smith is the VP of Marketing for Museum Way Pearls, a leading provider of pearl jewelry such as Tahitian pearl necklaces and black pearl stud earrings. Museum Way Pearls can be found online at: MuseumWayPearls.com. See photos and read about finding quahog pearls amongst the rarest of gemstones here. I totally agree with your statement. I have seen so many different types of pearls but none are comparable with Quahog Pearls. They are amongst the Rarest of Gemstones that you can find in this world. They are highly expensive as well.